Released in conjunction with ‘The Romance of Crime,’ ‘The English Way of Death’ continues the retrospective reimagining of Gareth Roberts’s trio of masterful The Missing Adventures tales that so expertly captured the vibrant essence of season 17. With the Doctor intent on returning some long-overdue library books, traces of time pollution in 1930 London alter his plans and bring him to a seemingly innocuous seaside hut that houses a peculiar mystery, a strange smell in the air perhaps signalling the oncoming death of the entire planet’s population. Unsurprisingly, the tone of both stories in this set is quite similar, ‘The English Way of Death’ also channeling the surreal humour of Douglas Adams while satirically poking fun at the social norms of the 1930s in the vein of Wodehouse, freely adding in zombie clichés, and presenting another larger-than life villainous entity in Zodaal as Terrence Hardiman’s Stackhouse comes into focus. The plot is rich and complex without ever becoming overwhelming, though the extensive comedy mined from the pandering of members of the upper class elite will obviously cater to a certain portion of the audience more than to others. Still, the incredible imagery employed throughout creates an undeniably visceral experience that makes the story of the gaseous Zodaal possessing beings as he searches for a new, permanent host to escape death breathe and develop wonderfully. It should come as no surprise that there is not a single weak performance even as some actors are tasked with bringing multiple roles to life due to the extensive character list from the original novel, and Hardiman is fortunately able to give an incredibly engaging performance that is so necessary for a prominent figure in a Baker-led story. There’s a sense of vibrancy to events here that continues to make these Fourth Doctor novel adaptations tonally distinct from Big Finish’s The Fourth Doctor Adventures, perhaps because Tom Baker and Lalla Ward have not featured together in that range yet, and both lead are absolutely in sparkling form. Baker is completely invested in the script and gives a wonderfully charismatic and dominating performance, and Ward excels when given the opportunity to play a more embarrassed version of Romana when her grand plan goes horribly wrong. Yet it’s John Leeson who arguably steals the show as K9 becomes possessed and gets a much-expanded role, his ability to carry scenes by himself astounding. Understandably, some of the Roberts’s voice can’t fully make the transition to audio due to the necessary reliance on dialogue. And although the dialogue is magnificent throughout, it does mean that there are some sections where the pacing must slow so that the characters can explain where they are and what exactly is happening. This is perhaps most noticeable during a lengthy excursion to the future as the villainous plot becomes better developed and understood, but the scenes are at least dressed up with immensely intriguing character development and actions. Still, the audio release manages to capture the overall essence of the beloved novel incredibly well, and the further humour resulting from the Doctor discovering Romana’s failure and the over-the-top zombies hungering for brains makes the transition flawlessly. 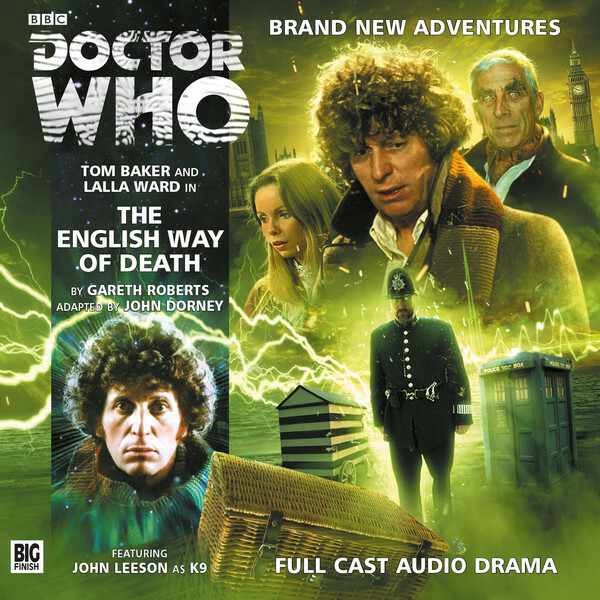 ‘The English Way of Death’ may not be quite as streamlined as ‘The Romance of Crime,’ but it rounds out this two-story set superbly and further reaffirms the reputation of both original author Gareth Roberts and adapter John Dorney as well as of The Missing Adventures in general, further fleshing out an incredibly-beloved era for Big Finish in the process.